My wife and I did it. We moved from Massachusetts to North Carolina. Although there were many stressful aspects of the move, the one of most concern to me was how do I get my musical instruments safely to our new home. You might find yourself in the same situation someday. It might only be a move across town or it could be a move across country. The concerns are the same although the options may be different. If you are moving across town you can ferry your precious guitars one at a time by car if that’s what makes you feel most secure about the transfer. That isn’t an option moving across country. Some particulars about our move. First, as you may have read in previous blogs, recently I had ten guitars. I had other instruments too but the guitars were most numerous and had the greatest value. The first thing I did in preparation of our move was to reduce the number of instruments I owned. I sold many favorites. Downsizing. I’m now down to only four guitars. Four guitars are easier to move than ten. Second, instead of using traditional movers we used a Pod. 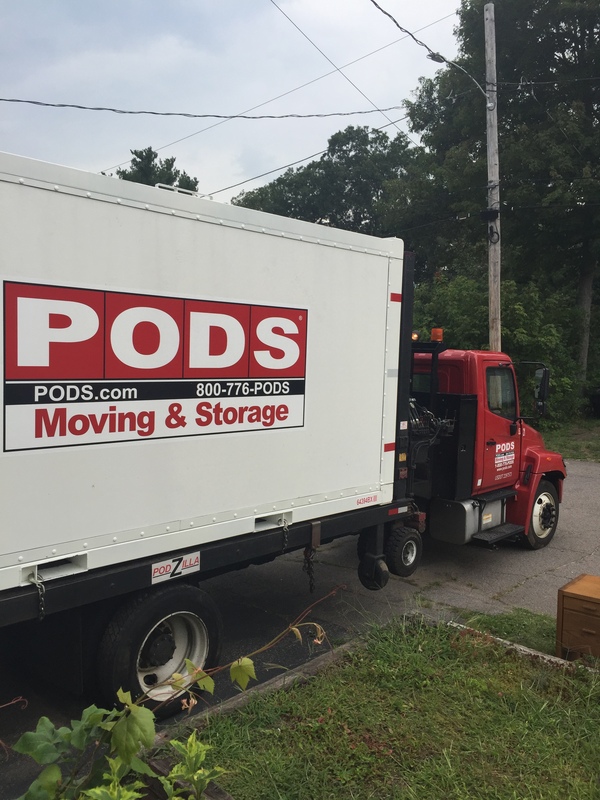 The pod is an 8 x 8 x 16 foot container that was dropped off in our driveway in Massachusetts. We packed it with all the possessions we wanted to keep and then they took it away. The Pod went into storage until we closed on the home we bought North Carolina. Because we couldn’t move right into our new home, we had to pack our car with everything we would need for up to several months. Four guitars are still a lot of guitars to try to pack into our car for the drive south with everything else we needed. I ended up bringing only three guitars in the car. The fourth, a solid body travel guitar, went in the Pod. My banjo went into the car along with one ukulele and my mandolin. Three ukuleles and my practice amps went in the pod. I sold my Fender Princeton amp. All I have now are small, inexpensive practice amps. The main worry about the instruments in the Pod was heat. We moved in summer. Hide glue used in high quality wood instruments might become unglued if the interior of the Pod was hot enough. I took my chances with the ukuleles I put on the Pod. I had obtained two of the ukes for free and one cost me only $30. These weren’t expensive instruments. In spite of the low value, I packed the instruments as if I were shipping them for Ebay. They were double boxed with plenty of paper padding to protect them. Where to pad neck and headstock in guitar case for travel. The instruments I packed into the car weren’t boxed — that would have taken up too much room. But each was in a case with the cases stuffed with padding to protect the headstock and neck the way you would for bringing a guitar on a plane. Other options considered but rejected for this move was to ship the instruments to myself by FedX or UPS. This could be expensive. You also would need an address to ship the instruments to. We had rented a UPS Store box. They will hold packages for you and in fact did ship some other items this way. The guitars would have to have been double boxed and padded as if shipping for an Ebay sale. It could work but I felt better having my favorite instruments with me. We also considered renting a UHaul trailor or renting a truck. Instead we purchased a clamshell car top carrier from Thule. It was worth the money and freed up space for guitars in the car. Clothes and other durable objects went in the Thule carrier. The good news is all the instruments are now unpacked and nothing was damaged during transit, whether by car or Pod. Right you are; we are getting old. Three years ago I left what was left of America’s workforce and began the study of playing plectrum guitar. Last year I bought a Steve Andersen Streamline. Zounds! Ah, the rub of maintaining 45% or so humidity. Potassium carbonate, as Planet Waves so profitability knows, keeps 43.16 % relative humidity at 25 degrees Celsius. Gortex and Superabsorbent polymer crystals, as Oasis so profitability knows, dispense water vapor without leaking, most of the time. Now I ask you Dan, white beard to white beard:: why the hell doesn’t this great country make a humidifier for stringed instrument cases that combines those technologies? You remember “Yankee Ingenuity” don’t you (you used to live there)? Maybe one of your readers can help a serious guitar player humidify his pride and joy before he is 71 this year. You’ve mentioned two of the three approaches that come close to providing what we acoustic instrument owner’s desires. The one you didn’t mention is Cordoba Guitar’s Humidicase which as best I can tell uses Potassium Carbonate to “activate” a sponge built into the guitar case. I agree with you — we should be able to build a better humidification system. Something that is closer to fool-proof, long lasting and really works. Good luck on your new passion. I’ll keep looking for improved humidity system and will report them in the blog when I find them. Feel free to let me know if you find something improved over what is out there now.